A black and white negative of veterans at the Armistice Service at the Cenotaph in Whitby, Ontario. Buildings at the Four Corners are visible in the background. The cenotaph was erected in 1924 at the south west corner of Dundas Street and Green Street. 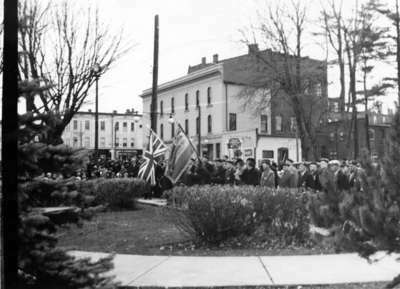 Armistice Service at Cenotaph, November 1939, Marjorie Ruddy. Whitby Archives 29-004-021.